Dr Bob Strong's GP surgery has been treating a lot of coughs and colds recently, far more than is normal for the time of year. Bob thinks there's something up but he can't think what. He seems to have caught it himself, whatever it is - he's starting to cough badly and there are flecks of blood in his hanky. Saskia Harden has been found on a number of occasions submerged in ponds or canals but alive and seemingly none the worse for wear. Saskia is not on any files, except in the medical records at Dr Strong's GP practice. 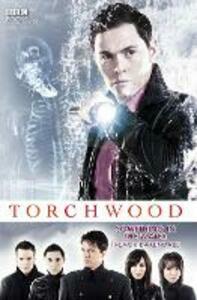 But Torchwood's priorities lie elsewhere: investigating ghostly apparitions in South Wales, they have found a dead body. It's old and in an advanced state of decay. And it is still able to talk. Featuring Captain Jack Harkness as played by John Barrowman, with Gwen Cooper, Owen Harper, Toshiko Sato and Ianto Jones as played by Eve Myles, Burn Gorman, Naoki Mori and Gareth David-Lloyd, in the hit science fiction series created by Russell T Davies for BBC Television.